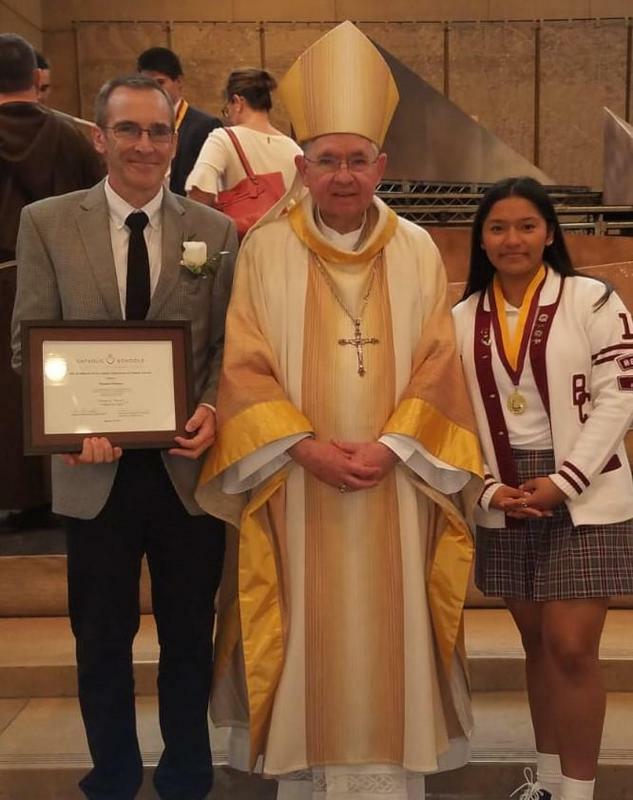 On March 19, seniors and teachers of the fifty-one Catholic High Schools of the Archdiocese of Los Angeles were honored at a special mass at the Cathedral of Our Lady of the Angels with Archbishop Jose Gomez presiding. In December of 2018, Damian Delaney volunteered as a liver donor to a person in need. He did not select or know the individual. He knew that he was blessed with good health and having a solid faith in God, he wanted to give of himself. He pursued being a donor through USC's medical transplant program. During the lengthy surgery, Damian's sister met the recipient's family in the waiting area. The recipient is a young mother of 3 young children who was experiencing liver failure and would not have survived without his selfless donation. Even though the operation has taxed his physical well-being and stamina, he has no regrets of his decision to save a life. This is true witness to Christian values, to freely give of oneself to his neighbor. Since her freshman year Anisha Verde has been serving at the Santa Monica Pavillion, an Assisted Living Facility in Los Angeles. She became very attached to the residents as they seemed lonely and looked forward to her visits. She is with them in the activity room serving snacks and playing bingo or helping residents with dinner. Sometimes she will do nails or take residents out for a walk. Anisha spends more time there in the summer, but tries to make time at least one weekend day every week. Her compassion for the residents is tremendous and it is through her experience and empathy that she became determined to work in the medical field with geriatric patients. Her service is not only there but in her daily life, Anisha observes where there is need and will offer what she can to help. She recognizes that she receives much more than she gives in her compassion for others.